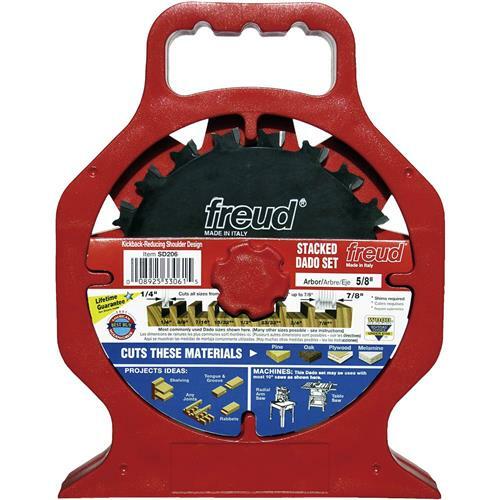 Freud's quality and craftsmanship in a stacked dado set, but at a wobble dado price! The negative hook angles make flat bottom grooves and virtually splinter-free cuts. It has two outside blades with three two wing chippers. This makes it ideal for underpowered saws because it requires less power to feed. 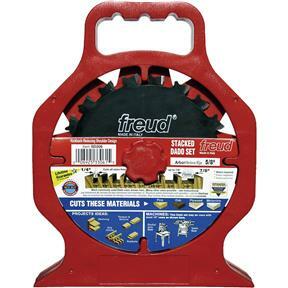 All blades and chippers come with Freud's antikickback design. This resharpenable set will produce grooves from 1/4" to 7/8". This dado set comes with a shim set and carrying case as well as instructions on how to make basic dado sizes. Very sharp and cuts a real nice dado. Recommend to buy.